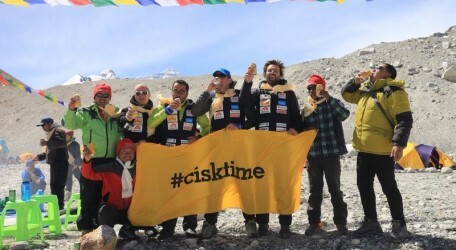 A group of 4 Maltese intrepid mountaineers left Malta at the beginning of April to begin their Mount Everest 2014 expedition, this time approaching the mighty mountain from the North-East side. The team is made up of Gregory Attard, (who made headlines in 2010 by forming part of the first Maltese team to conquer Mount Everest together with Marco Cremona), Matthew Xerri, Raphael Fenech Adami and Douglas Barbaro Sant. This particular expedition route is known for colder temperatures and harsher winds, and is more intensive and technically difficult. “We have been training rigorously for the past months and we are ready to face the Mount Everest challenge, thanks to all the sponsors that are supporting our adventure, including Cisk Lager.” commented Gregory Attard, during the sponsorship presentation held inside the Farsons Brewery.